Synopsis: A hundred years after catastrophic shifts in tectonic plates caused most of its area to submerge, Japan now thrives as a maritime nation. High functioning cities line the coasts of Japan, and well developed sea routes are defended by specialized naval ships. The marine industry is flourishing, and young girls are eager to join the Blue Mermaids—highly skilled women who devote their lives to protecting the seas. From the outside looking in, it might seem that High School Fleet is something along the lines of Girls und Panzer on the high seas, but that’s not the case. Seeing as how much I liked Girls und Panzer, I’m not sure if that’s a good thing or a bad thing, but HSF turned out to be a more serious take on war games. I thought this wouldn’t be much more than cute girls doing cute things on ships, yet it’s surprisingly heavy on action and drama, which turned out to be a fairly enjoyable combination. Neither the action nor the drama are particularly noteworthy (especially the drama), however, it’s the bizarre plot twist that sees a virus/disease (scurvy! Okay, not really…) spread amongst the students—turning them into mindless minions of some nefarious entity—that really shakes things up. Yeah, it’s ridiculous, but I’d be lying if I said I was expecting something like that in this show. Without that turn of events, HSF might’ve been completely forgettable, so maybe this was a blessing in disguise. It’s also a little hard to believe that with practically no adult supervision, a group of high school girls would be given free reign to command a warship, especially when they have yet to complete nautical training. The drama in this show can feel a little contrived, and despite cannons and torpedoes being fired from one ship to another, you kind of got the sense early on that this was one of those shows where the characters wouldn’t suffer anything more than scratches, which negated some of the drama for me. 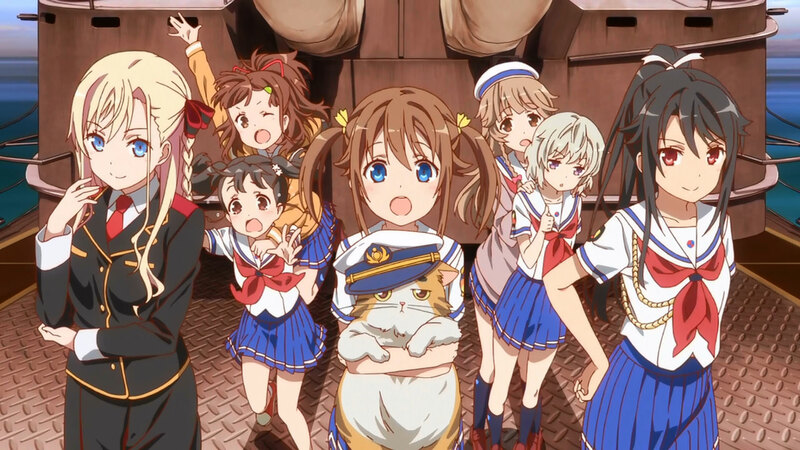 For someone expecting “Girls und Panzer in boats”, High School Fleet was a pleasant surprise, however unusual and unrealistic it might have been. 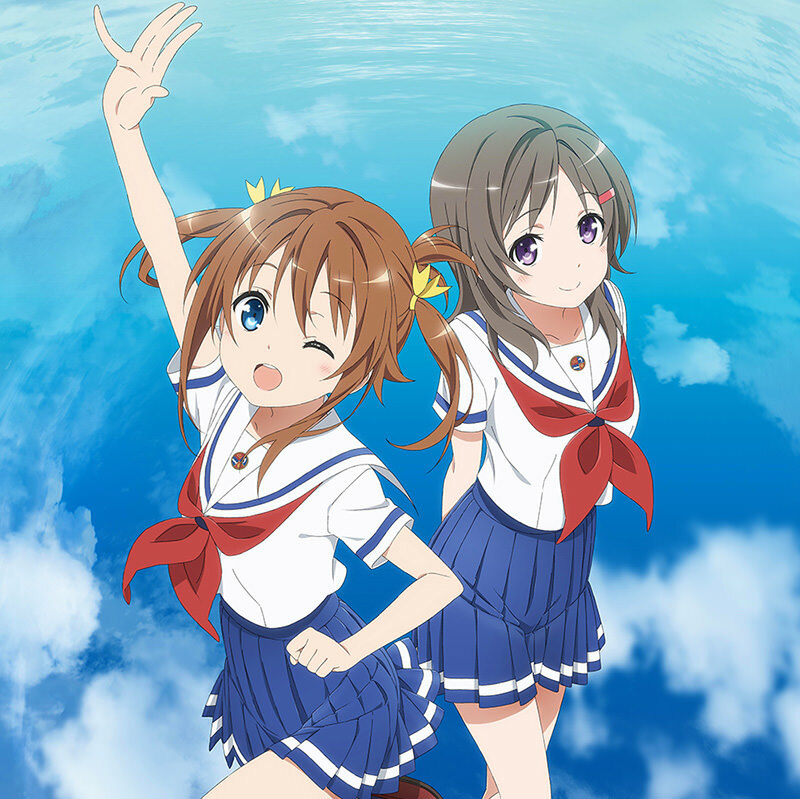 If you can throw logic out the window and just embrace the nonsense, there’s an entertaining story here that marries action on the high seas with a little bit of slice of life, resulting in a surprisingly watchable anime. “Decent” is probably the best compliment I can come up with for Mike, who’s one of those protagonists that I generally don’t enjoy very much. She’s your everygirl who winds up being the captain of the Harekaze, a smaller ship that’s home to a ragtag group of girls that weren’t thought of very highly. At times, she’s pretty inept in her leadership role, with Mashiro being much more fitting for the role of captain, yet this was one of those instances where a bland character gets outshined by several girls with lesser roles. Mashiro, the Harekaze’s deputy captain, was one of those girls. The youngest daughter in a family with deep ties to the Blue Mermaid program, Mashiro was pretty much the opposite of Mike. Inadvertently cute but still very professional, she’s a likable character that feels out of place on board the Harekaze. She makes up for a lot of Mike’s deficiencies as captain, and she was probably my favorite character in the entire show, but there were others that also made a positive impression on me. Earlier I mentioned that I didn’t think this show wasn’t really watching just for the yuri, so let’s get to that. For all intents and purposes, this show only has female characters, so while it’s natural to ship some of the girls together, I was a bit disappointed in the level of subtext. Early on, I was thinking Mike x Moka would be the main pairing here, but Moka ends up as captain of another ship, so apart from the very beginning and the very end, she’s largely absent. As captain and deputy captain, Mike and Mashiro spend a lot of time together, but they don’t see eye to eye on a lot of things, so only in that “opposites attract” kind of way would you want to pair those two together. One of the supporting characters that doesn’t get much screen time, Mimi, seems the likeliest candidate to be the show’s resident yuri character, but her fondness for Macchi is barely touched upon and is all but forgotten as the show turned more serious. You could ship Wilhelmina and Kouko together, as their shared love for Japanese gangster movies sees them form a nice bond, and they even have a couple of cute moments when Wilhelmina leaves the Harekaze and eventually returns. That’s great and all, but I was honestly hoping for a little more subtext. Then again, Girls und Panzer wasn’t particularly heavy on the subtext, so maybe those comparisons are just, and my expectations were too high. Regardless, even though I wasn’t a fan of Mike, I think that this cast was greater than the sum of its parts, and overall, this was a pretty nice group of characters. 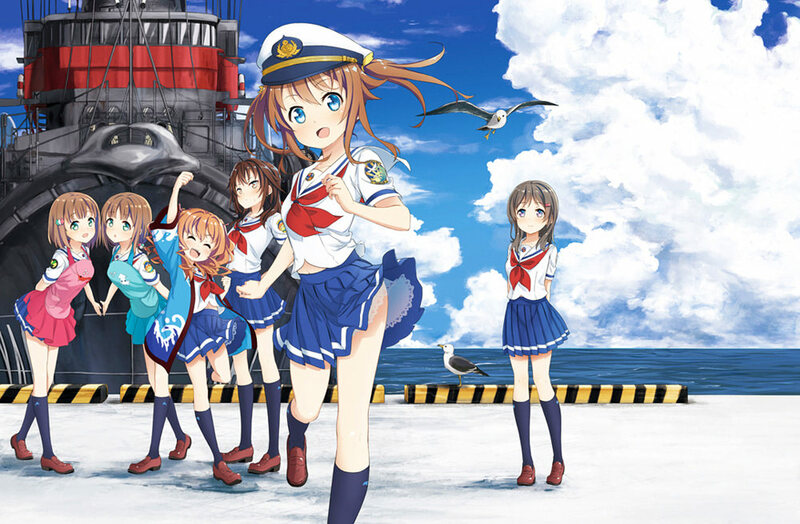 This entry was posted in Anime, Anime Review and tagged High School Fleet by Rock The Vogt. Bookmark the permalink. When do you think they’re going to release this show on DVD in the west? I’ve seen a few clips of the show and it looks pretty good, and I like military anime, so I thought it would be worth acquiring. No idea. It’s been nearly a year-and-a-half since the first DVD/Blu-Ray was released in Japan, yet I don’t think that there’s been any news about a stateside release. I really wanted to like this one, but in the end is was just kind of OK (I think I scored it as a 6). I agree about the MC, I am usually pretty forgiving, but she was just not a strong enough central character for me to be drawn to. When they finally introduced the whole rat thing I literally face-palmed at that point. Still the end was at least exciting, and then the final reunion of Mike and Moka. My favorite was Wilhelmina. She was just a great all round character and I enjoyed all the scenes that had her. Rin was pretty cute too. The 2 OVAs are OK, giving a bit of closure on the Harekaze.